In collaboration with Wladimir Olenburg we made some of the window. An example of glass etching technique in the modern glass design. The catholic parish church St. Adalbero is located in the district Sanderau in Würzburg, the oldest district founded in the second half of the 19th Century, outside the ring parks, the former cordon of fortresses. St. Adalbero is situated on a terraced ground as a neo-Romanesque basilica in strict forms, with transept, octagon at the crossing and a two-tower facade. She was built from 1894 to 1899 from sketches of the master cathedral builder Franz Joseph Ritter of Denzinger by Joseph Schmitz. 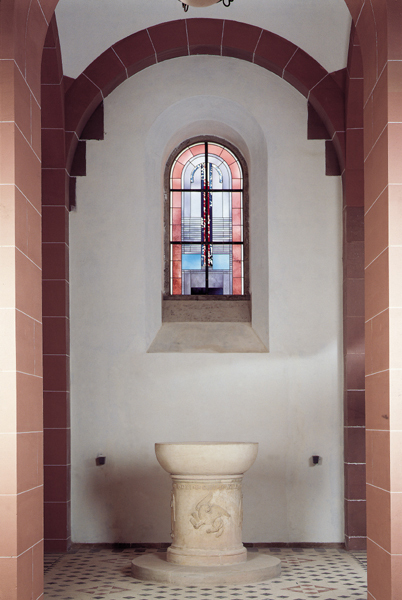 As part of a wide-ranging renovation 1992-93, the existing church windows in rectangular layout were replaced with redesigned window of Wladimir Olenburg. 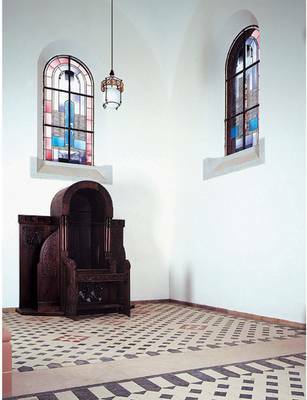 The implementation of the artistic specifications was, according to Vladimir Olenburg design, with etching a brush structure on real antique mouth blown flashed glass and a contour of black stain on.